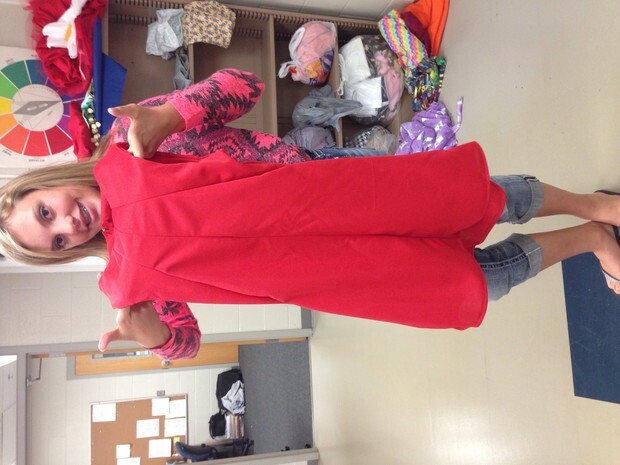 This is a red dress I made in clothing management. I had a pattern and I sometimes used it but towards the end, I kind of just did my own thing. This project was a little difficult because of the collar line, and the interfacing because all this fabric and interfacing is laying in there with no place to go. I think to make this dress you really have to concentrate on the pattern, because you miss one step and the whole project is ruined so you really need to know what you did last and what you're doing next, because I kind of had a lot of different things going on at once so it didn't really work. To make this project you just have to be good at installing zippers, and reading patterns. The two things I have not yet mastered. I used a red fabric that is a poly-cotton. It feels a little stretchy and a little soft. First I had to cut it out the project, and then I had to cut out the pieces, and I sew the front two pieces then the sides. Then the collar, zipper, and then fix it up with some last minute(or should I say last 8 days) touch up's. I already knew a few things about how to make my dress but I didn't know how to do a zipper or interfacing. It was a little tricky at times but it eventually all came together. It looked like the best pattern in the store, it also said jiffy on it, so I thought it would take less time then other patterns, but it didn't. It did challenge me but overall I learned a lot about making darts, applying interfacing, and installing zippers. Next time, I could try to do more of it on my own. I think I asked Ms. K a little to many questions, so I'll try harder to just figure it out next time. I was a little happy with my dress, I mean it could have been better, but if I didn't fix it to my size it would've been way worse, so I actually kind of like it. 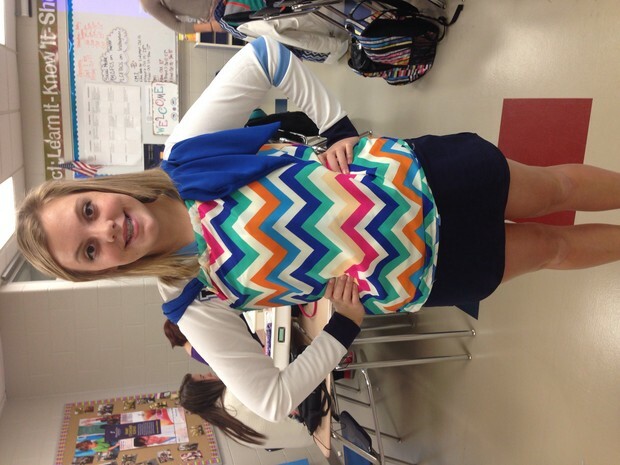 In my clothing management class I made a chevron shirt, and I did use a pattern to make this shirt. To make the shirt that I made you just need to know how to read directions and look at pictures. The pattern I picked out had a lot of really good pictures which was helpful to me because I don't always understand what they mean when using words. I think the shirt I made turned about to be cute, and is really trendy. The material I used to make the shirt is kind of a polyester type fabric. It feels almost stretchy and is very soft. First I had to cut out all my pieces, and then I took the man to sides and sewed them together right sides together. I finished the bottom of the shirt. Then I took the separate tie piece and folded it right sides together, sewed the edges, and folded it inside out. At the top of the shirt, I folded it over and sewed so that there was a little space(tunnel like thing) for the tie to go through. And the last step was tying it together so it actually was like a shirt. I chose this pattern because it looked more cute then some of the other ones on the wall. It really did not challenge me that much, all though it was challenging to get it so that you did not see the stitch. I think next time I could take my time, and not rush through anything too much. I am a little satisfied because I think this shirt is super cute. 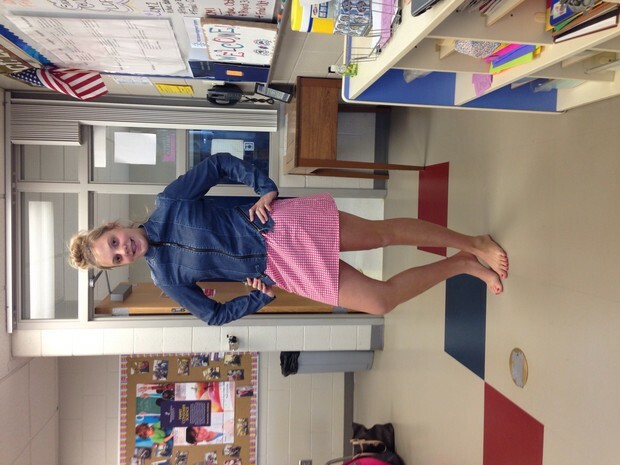 This is the skirt that I made in my clothing management class. I used a pattern while making this. The skirt is pink, short, and doesn't fit too well. This project didn't really emphasize much skill, I mean, everything that went well and looks good are simple skills, like making a men and knowing what it means when it says right sides together and such. The skirt feels not too hard, but not super squishy, it is cotton, a pink pattern cotton. I cut out pieces, I sewed the two back pieces to the sides of the front, I put a band around the top then installed a zipper and dress hook. After the dress I knew a little bit more about zippers and dress hooks, although it still didn't look to good, I knew how to put them on. I choose it because the picture looked cute and I thought it would be not too easy not too hard, and it wasn't hard, I'm just not that good. It did challenge me a little, like the steps weren't hard it is making stuff even, and making things look good. I think the darts and dress hook really screwed this one up. I couldn't make the dress hook look good, and nothing worked well, and the darts never matched up so I could easily say it was one of my not so good ones. I wish I would have made it look better or done something different so the dress hook didn't look so bad. This project I made was a blazer, and although it's an incomplete, I worked hard, using a pattern, to make it look it's best. The project is someone of a wreck because the fabric frays real bad, so I was constantly cutting off strings, and it was making holes in my project. I wish I would have got a different fabric. This requires a skill of knowing which piece is what, and being able to understand the pictures and words in the directions and also understanding sleeves. I've never done sleeves before so it was quite tricky. It felt wool like, and I think it may have been wool. It was thick, black and white, and soft, really soft. To make this I cut out 29 pieces, yes 29, although in the end I did not not use all of them. I then started at the back and worked my way to the front with the pieces that form like the base of the jacket. I worked on the collars then the sleeves, and lots of things I did I did not have much prior knowledge. I chose this project because it looked cute and looked like it would challenge me somewhat and it did challenge me. I have never made anything with sleeves before and so It was hard to put those on and figure out what pieces were to go around it. Next time know which piece is which and where it goes so I save time not having to seam-rip it. I was happy with what I had done, but I wish I would've done it right the first time.